When CPO strikes gold, it doesn’t just find a tiny nugget: it opens up a whole seam. 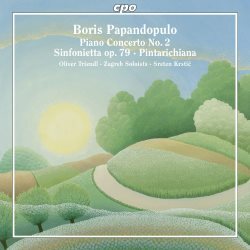 The latest gold mine is Boris Papandopulo, a Croatian composer active throughout the entire 20th century. Papandopulo’s name comes from nowhere. He studied composition with nobody famous, although his soprano mother got her friend Stravinsky to write him a recommendation letter. He spent most of his career conducting regional ensembles and choirs in Croatia, with a break to lead a symphony orchestra in Cairo. In different periods, he dabbled with folk music, neo-classicism, and the avant-garde. This is, so far as I can tell, the second-ever Papandopulo CD, after a solo piano recital on Albany TROY1274 but what incredible music this is. The piano concerto, scored for piano and string orchestra, has two short, speedy movements bookending an astonishing 16-minute lament. The beginning leaps and dances in a way that will appeal to any neo-classical music lover: you’ll think of Poulenc, Martinů, Dag Wirén and the second Shostakovich piano concerto. A sunny, emphatically tonal main melody gets spiced with fun Prokofievan dissonances as it develops. Then, as quickly as it began, it’s over. That slow movement marks the introduction of a strong folk music element, transporting us instantly from Paris to the hot, sun-baked Croatian hills. The piano does not enter for five entire minutes, waiting even for the violas to introduce a solo chant-theme. The soloist gets a cadenza, then collaborates with the orchestra on a song which builds to a big, conflicted climax. The structure is symmetrical, which means a piano is playing for only six minutes out of sixteen. Then the finale brings us back to a lighter, livelier atmosphere, and a joyful conclusion. I have no idea why this structure works, but it works very well. The Sinfonietta for strings is another work of neo-classical and highly contrasted moods. The introduction begins as purely and sweetly as Tchaikovsky, then slides downwards into a disturbing funk. Out of that comes what else but a perky march. This tune resembles Dag Wirén’s famous Serenade. Papandopulo’s music in general is hard to describe without sounding far crazier and more illogical than it is when you actually hear it. It may take twists and turns, but they make sense to the ears. He sticks carefully to old-fashioned structures and harmonies, except for a nice helping of 1920s chromatic and dissonant high-jinks. Again, the slow movement of the Sinfonietta reaches into a deep bag of melancholic folk-tunes, and is beautifully constructed around a long violin solo which is played with impressive skill, full tone and heartfelt expression. The short “dessert” on the recital is a suite of four orchestrations and adaptations of works by a Croatian composer from the 1700s. Pintarichiana is thus comparable to Casella’s Scarlattiana, Rodrigo’s Soleriana or a pocket-sized, strings-only version of Respighi’s Boutique fantasque. Papandopulo was clearly taking his orchestration notes from Mozart serenades and Eine kleine Nachtmusik with delightful results. The performances are really superb and the Zagreb Soloists are at the height of their art. Sreten Krstic conducts skilled performances and he gives one, too, as the violin soloist in the Sinfonietta. The music always sounds fresh, vibrant and worth hearing repeatedly. Pintarichiana has an electric zip which makes the music even more fun. Oliver Triendl is a good piano soloist in the concerto, too, handling all the leaps and dancing rhythms with ease but his piano is seemingly placed right under the microphones. Aside from that, the production is superb. I hope this is the beginning of a series, because it’s non-stop pleasure and a major discovery.